Today, if someone is looking for a food joint, or for a plumber to get their sink fixed, all they need to do is run a simple search on the internet. Do you know that businesses that appear at the top of the search engine results page (SERP) gets 33% of the search traffic? It follows that how well your business ranks in the search engine results will directly translate into how many more new customers your business can get. Approximately 80% of internet users use the internet to find local businesses. In this ever-expanding digital world, appearing on top of the search engine results is vital in making sure that customers find you when they search online. And to do that, you need to make sure that your business’ local SEO is on point. In this post, we’ll give you a step-by-step instructions on how you can conduct a local SEO audit by yourself. As you probably already know, SEO is short for search engine optimisation. Optimising your website for SEO makes it easy for search engines to discover and index your content, your website, and your business. In other words, it helps you get your business in front of the right audience, and increases the amount of traffic that you receive organically. Local SEO is a more precise form of SEO that applies to the local businesses specifically. One good example is optimising a website for “near me” searches. Local SEO is quite different from the mainstream version in that it uses certain ranking factors that don’t appear in ordinary SEO. This makes a lot of sense because the journey of the buyer is different too. Local buyers are often looking for somewhere (or something) close by, and they are much more likely to make purchases soon. These customers often search for details such as directions and phone numbers of the relevant businesses to get this done. However, before you set out to become successful in local SEO, you have to know where your website is ranking. This entails auditing your onsite and offsite local SEO, checking that the basics are working, and ensuring that you aren’t carrying penalties. That’s what local SEO is all about. Performing a local SEO audit for your site will improve your chances of showing up on the relevant local searches that people around you are making. Getting your business listed on the various online directories is the first step when it comes to optimising your business for local SEO. To get a good picture of how this is done, check out the results of a popular search term like “restaurants near me” and check out where it appears in the search results. 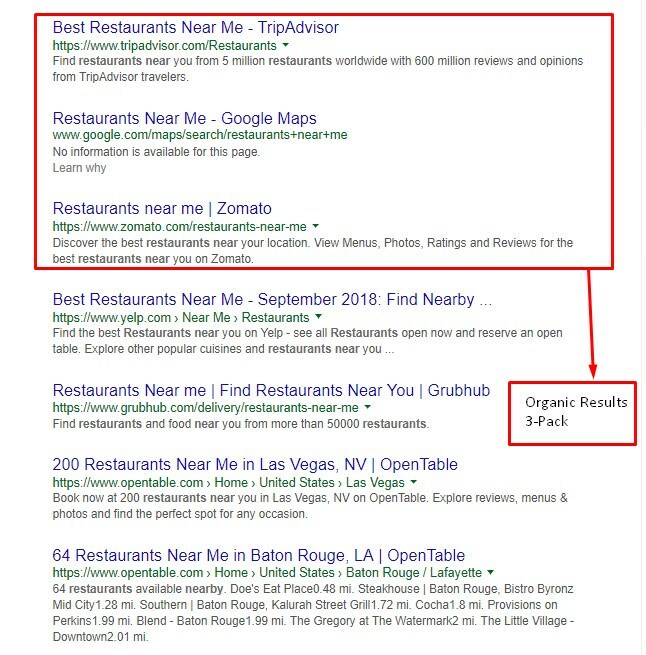 As you’ll see, the Google listings are followed by links to TripAdvisor, and Google Maps and your local restaurant or restaurant finder, which are all third party sites that offer data about local businesses. This means that you need to ensure your business is listed on all the top directories out there for having an effective online presence. If you think it’s going to be difficult for you to get your business listed manually on all these platforms, you can use an automated business listing platforms like Synup to get the job done. Depending on your industry, you also need to make sure that your business is listed on not only the search engines, but also directories such as TripAdvisor, Angie’s List and Yelp. 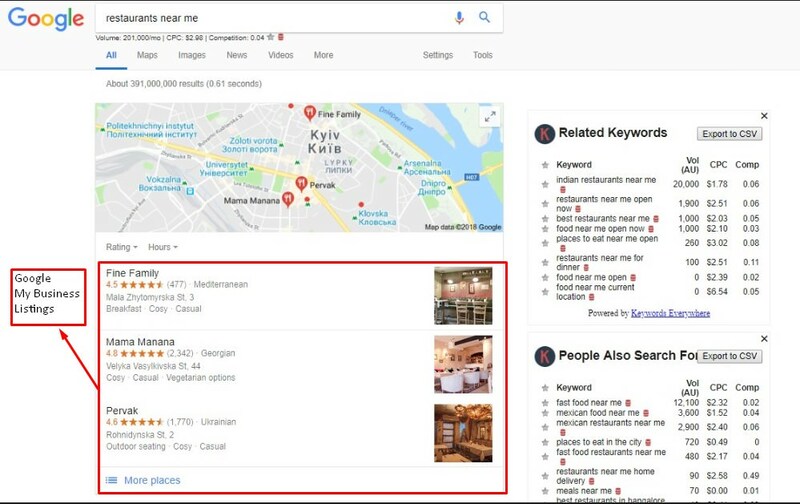 Furthermore, you want to make sure your business is listed on Google My Business (GMB), which is ideally the main source for Google’s local business listings. If you’re not listed on Google My Business, you won’t show up on Google Maps, and this is something you certainly don’t want for your business. Google actually says that is uses location, relevance, and prominence to ascribe the local search ranking. Prominence is basically citations. If you already have a GMB listing, ensure that the information posted there is accurate. This means the phone number; address, postcode, and other information such as working hours are accurate. To make your work easier, search your business name and list all of your citations. Copy your accurate name, address, and phone number from your GMB page and then go through the list making sure each entry is correct. As a rule of thumb, include anything that could end up costing you a valuable customer. Create a list of up to 7 keywords that you intend to rank for. For instance, if you own a plumbing business in Fitzroy in Melbourne, your keyword list may include plumbing repair, plumbing maintenance, Fitzroy, plumbing installation, and other related keywords. Ensure that you use easy-to-read, neat titles and descriptions. Have the city and state of your business in the title tag. This will help to rank your business higher whenever a user searches for a term that contains your locality. A description that contains the search terms that users in your area are likely to use will be helpful as well. The content in your title tag should generally be under 60 characters in length, while the meta description should be around 135 characters. This will help the search engine bots, as well as humans, to gather what your business is all about quickly. Use H2 tags for subheadings and do not forget to add the variations of targeted keywords in the subheadings. H3 tag and other tags should be used for additional subheadings. As you must be aware, page speed is used as a ranking signal by Google. Make sure that your website loads in less than four seconds. Use faster hosting, compress all the images and use a CDN to boost site speed. These may not directly play a role in SEO but more social shares mean more visitors. You’re also likely to get high quality links through social media sharing. Don’t make the mistake of not having any outbound links on your website. Google uses these links to decide on the topic of your website and it also gives a great signal that this page is an excellent resource of quality information. Ideally, there should be 3 to 4 outbound links in each post. You should include high-quality images, audio and videos in the content as it will help in increasing the time on-site which is an important parameter for rankings in Google. If you do not have time to create your own video, find a good video online and embed it. The image file name should include the targeted keyword and it should also be part of the image Alt text. Try to manage keyword density of 1 to 2%. Ideally, it should come naturally but take care to not overdo it. Create curiosity with your first paragraph and sprinkle in as many LSI keywords or alternative versions of your keyword as possible. H1 tag is meant for your headline. Include the targeted keywords in H1. Use H2 tags for subheadings and do not forget to add the variations of targeted keywords in the subheadings. H3 tag and other tags should be used for additional subheadings. Contrary to popular perception, meta description is still relevant. Try to use as many LSI keywords as possible in the meta description. There are several online tools that can help you find LSI keywords for the targeted keywords. Internal links boost the ranking juice for other webpages of your website. Don’t go overboard but try to include at least 2 to 3 internal links in each post. So, if you want your site to appear in the organic searches, you have to make sure that you do this well. Once you have put up your business on the online listing and optimised the keywords and metadata, you need to work on the content on your site. The frequency and occurrence of keywords on your site has a major role in determining your ranking in local searches. For instance, if you are operating an auto repair shop in Chatswood, NSW, writing about your topic of expertise on your blog along with posting about the various events that are coming up or have held in your area can help improve your local SEO. This is quite straightforward to do if you’re using a CMS like WordPress, as it lets you optimise the URL, category, title, etc. with ease. There are also WordPress SEO plugins like Yoast SEO that help when writing content to make sure that you are on the right track for generating great results. Keep in mind that content is one of the major issues for local sites. It’s actually one of the key targets for Google Panda algorithm update, which was aimed at eliminating spammy sites and thin content. Therefore, if you publish thin, aggregated, spun, irrelevant, or duplicated content, your search rankings might suffer. Audit your content using the Google Analytics tools to track the amount of traffic each post and page is receiving. You are likely to find out that a small number of posts are generating much of the traffic. In case there’s a page with few or bad links that are pointing to it, and doesn’t generate significant traffic, consider killing it off. It’s generally far better to have fewer posts that are relevant and truly useful to your users than having a large number of duplicated, worthless, keyword-stuffed content. The usefulness of content to the readers is essentially what Google uses to score your content on. Social media platforms like Facebook allow you to post your address on your page, which helps boost local SEO. The review score you get on Facebook will also sync with your Google My Business listing. Platforms such as Pinterest will often show up whenever the user searches for an image. Social Signals are defined as the collective overall social media visibility. This means the number of shares and likes are included & social media visibility as perceived by search engines. These actually contribute to organic search ranking and are considered to be a form of a structured citation. Ensure that you have a handle on all of the top social networking sites. If you need to, appoint someone to manage your social media. You will be surprised at how much social media can help with your business’ growth. Social media essentially provides you with a platform for engaging with your local target audience, and you can even link your social media profiles to your Google My Business listing. Several social media sites also allow customers to leave behind reviews about your product or service. Based on the kind of reviews you receive, your business can pique the interests of more customers, or make them avoid you altogether. Ensure that you engage with your customers on social media regularly and respond to the reviews that they post on your business listings. Establishing a good rapport with your happy customers will help make them return customers, and responding to the unhappy ones might change their opinion about your business. If needed, use a review generation wizard to help automate this process. The number of backlinks you generate is be directly proportional to how well you rank in the SERPs. For those who don’t know what a backlink is, it’s simply a link posted on another website (often in the content) that directly links to your site. Conducting a quick backlink analysis is not difficult, one of the easiest tools to help you do this is the Moz Link Explorer, which is ideally a backlink analysis tool available free of charge. You only need to enter your site’s URL and click on “search”. The tool with then give you a list of backlinks that your site has received from other reputable sites. It will also highlight the exact source of the backlink, the anchor text used for posting the link, along with an authority score (Page Authority and Domain Authority) of the site. If you have a backlink from an authoritative website, it’s certainly going to boost your ranking on the search engines. Think of the website you know to be most reputable among the internet community of your business. You can then optionally write to them and request for a backlink to your blog or website. The MOZ OSE tool will also show your spam score. A spam score of under 3 is considered good for your site. It’s quite unlikely that your site will be penalised by Google if it happens to meet this criteria. As we’ve outlined, conducting an audit of your local business SEO is quite straightforward, yet vital for your business success. Recent statistics show that more and more users are making local searches now, so it’s crucial to have an optimised local SEO presence to improve your digital marketing efforts. 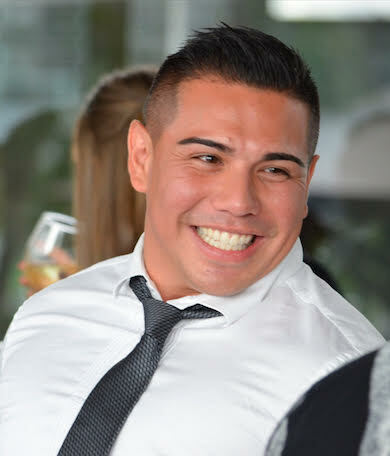 Cameron Francis is the co-founder of The eTraffic Group which started as a 2 man start-up from his lounge room, to a 50 person+, multi million dollar company. For over 10 years Cameron has been providing growth hacking and digital marketing strategies for small businesses, start ups & entrepreneurs. He helps companies like Retreat Caravans, Melbourne Real Estate, and Roth Newton grow their revenue.